With the rise in the need for online security and anonymity, people all around the world have started using Virtual Private Networks (VPNs). VPNs now happen to be one of the most reliable and popular tools for protecting online identity and security, whether you are browsing online, accessing your social media profile, performing a bank transaction, or transferring confidential files by email. No matter where you are located or where you travel to, a VPN service will be of great help, especially when you use unsecure public networks or Wi-Fi hotspots. One such VPN service is TotalVPN. This VPN service Provider has been gaining a lot of attention lately.Out of all the Virtual Private Networks (VPNs) we looked at, we found this VPN to be one of the most stable and offered the best pricing options in VPN Market. 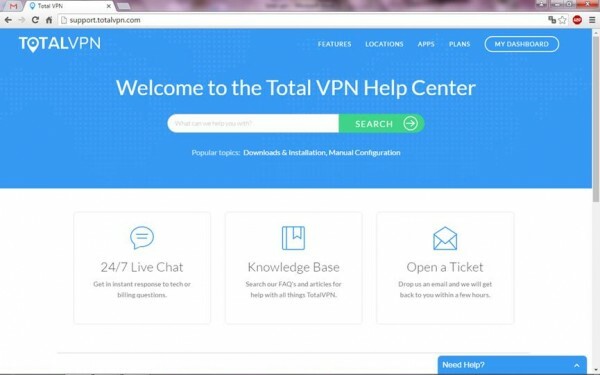 Further in this page, you will be able to find a detailed review of total VPN, helping you determine whether or not it will suit your needs. If you have been learning about or comparing the different VPN services available on market for quite some time now, you would be aware that TotalVPN is a newcomer in the VPN industry. The VPN is growing rapidly, attracting users from different walks of life by offering a lot of basic and advanced features. Though the VPN is new, you will be highly surprised by the level of professionalism and efficiency in each of its features. The VPN service provider offers a totally unrestricted browsing experience to their customers with unlimited bandwidth which can be accessed by the user at any location. The software does not keep records of their clients browsing history and hides their information from third parties online. Similar to any other VPN service provider, TotalVPN helps you encrypt all your data transmissions and hide your IP address so hackers, fraudsters, and even government agencies cannot gain access to and steal your data. Taking into consideration how new the service is, it has to be mentioned that the website and interface is quite simple and clean, and the company provides a good service that will satisfy the needs of most users. 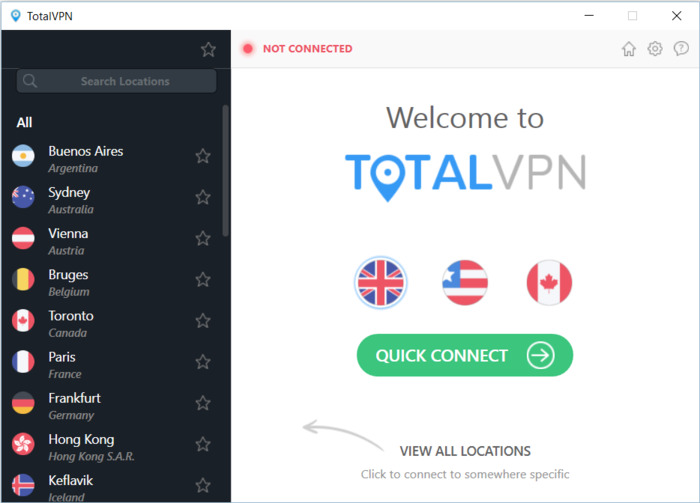 To know more about what TotalVPN has to offer, here is a closer look at its features. When it comes to server locations, TotalVPN is definitely not the richest VPN service provider on market today. However, the provider has servers located strategically all across the world. It has 25 servers in Europe, 22 in North America, 9 in Asia, and 1 each in Oceania, Africa and South America. As you can see, the company has servers covering all seven continents, which makes it easy for you to choose and connect to a TotalVPN server no matter where you are. As you would expect from a VPN service provider, TotalVPN offers all necessary security and anonymity features to hide and protect your personal information, location, and IP. The service follows a No Log policy, so there will be no monitoring of your online activities. 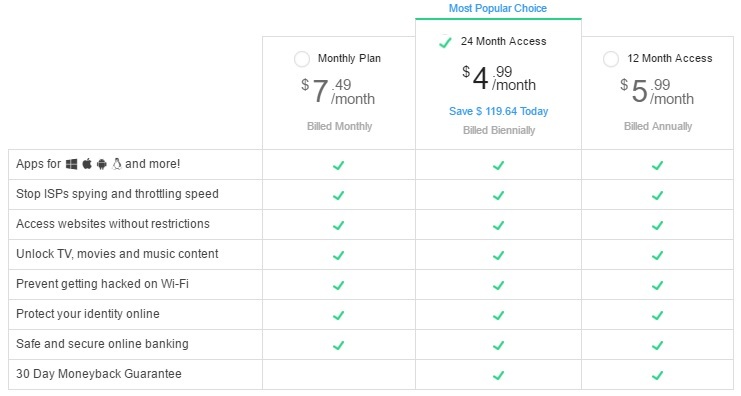 By choosing the Premium plan, you get to enjoy limitless data access, great uptime, 24/7 support, high security with the use of leading protocols like PPTP, SSTP, L2TP, etc., unrestricted bandwidth, allowing of Three simultaneous connections at a time and multiple device support. The all premium plans offer 60+ servers in more than 30 countries, unrestricted data transmission, unrestricted bandwidth, access to all protocols, and connection to three devices. Also, TotalVPN is planning on introducing a Premium Proxy service for Premium users. TotalVPN accepts different payment methods including Mastercard, Visa, and Amex, both debit and credit cards. The service also accepts payments through PayPal and working on dealing with BitCoin in the future. Total VPN offer 60+servers distributed across the globe spread over 30 countries including US, UK, Canada, Australia, Germany,Ireland, Amsterdam, Belgium, Iceland, Russia and many other countries. TotalVPN is designed to be compatible with a wide range of devices and operating systems, such as PlayStation, Xbox, Apple TV, Amazon Fire, Windows Surface, Blackberry, Windows Phone, Google Nexus, Mac OS, iPad, iPhone, and Android. If you are a Chromebook user, you need not worry because the service is working on supporting Chromebook as well. The configuration and connection of all the apps are simple and easy, and does not require any type of technical knowledge or skill. When it comes to performance, TotalVPN offers a user-friendly interface where you can connect, disconnect as well as change a server. All you need to do is signup for the service, download the TotalVPN Client on your device, enter the login credentials, and directly connect to a server of your choice from the list. The performance of the VPN is so good that you can even access on-demand entertainment websites and enjoy your favorite content without any interruptions and lags. To be precise, you get more than what you pay for, which is a great aspect for a new service provider. After taking into consideration all the different factors, TotalVPN is certainly an excellent service with efficient apps, speedy servers, affordable pricing plans, and useful, first class customer support.